This is a reminder for those of you in the Portland, Oregon area, who plan on coming to my illustrated talk, Once Upon a Thread. 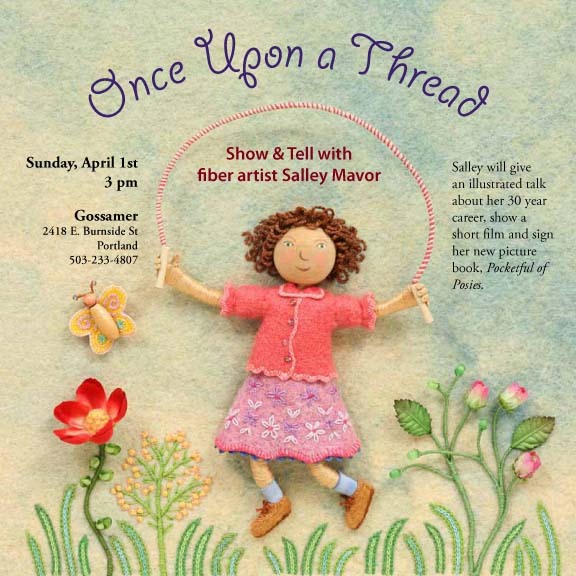 I’ll be at Gossamer on Sunday, April 1st at 3:00 pm. I recommend getting there early, as space is limited. I plan to be there by 2:00 pm to mingle and chat. It will be wonderful to meet my blog friends! This entry was posted in Children's Books, Fabric Relief, illustration, Travel by Salley Mavor. Bookmark the permalink. Oh I really would love to attend but not possible at this time. wish I could go!!!!!!! Hope you come down to PA someday!! Please visit southern California one day, that would be so thrilling, I know that your illustrated talk will be a huge success. Yes, I’ll be there! I just got back from a trip last weekend to Portland and then the OR coast, but the daughter has to get back to college on Sunday and it’s my chance to also see your presentation. See you then! Hope folks from the Portland Waldorf School community, especially the handwork teachers, come out to see your extraordinary work.